On Saturday November 3rd, deVine will be hosting our first ever Top Drops: Single Malt Scotch tasting. If you’re familiar with our Top Drops series you know that these events are a great opportunity to taste through several top shelf bottles you wouldn’t ordinarily get to try. 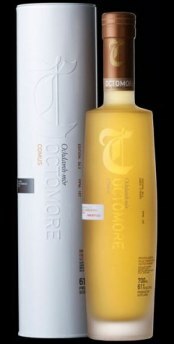 With Whiskies ranging from the classy Auchentoshan 18 year old with its layered honey, vanilla, and citrus notes to Bruichladdich’s infamous Octomore 4.2 Comus (the most heavily peated whisky in the world), we’ll explore unique whiskies from the major regions, with a slight bias towards the smoky drams of Islay. As well, we will also spend some time focusing on the under-appreciated art of food and whisky pairing. The final menu is set and it proves to be impressive across the board. There are only a few spots remaining for this sit-down event as of this writing so sign up now to avoid disappointment. You can book your spot here.. We will also offer 5% off those drams tasted at the event that night. deVine is pleased to welcome back our old friend Jimmy Clooney who will co-host this special event. 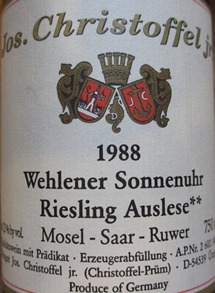 This coming Saturday, October 13th is the second of two Top Drops: German Rieslings. This time, we’ll focus on the famous regions of the Mosel, Mosel-Saar-Ruwer and the Rheingau, where many famous producers reside. with bolder flavors, some diesel qualities and rich ripe abundant yellow stone fruits. Featured will be the wines from the legendary and most expensive German producer Egon Muller along with other notables including Joh J. Christoffel that many of you are familiar with and for dessert, there will be a rare Beerenauslese from Reinhard Beate Knebel. All three top drawer producers. For those of you who have not had your German Riesling epiphany, this is your chance to acquire this feeling. We will be serving interesting food pairings to showcase the versatility of the grape. Hurry and register for this small and intimate sit-down tasting for 18 people. Book your spot here..
1) NV Reversanti Prosecco – $16.49 – a deVine bestseller over the last year, the momentum continues unabated for this Prosecco. 2) NV Langlois-Chateau Cremant de Loire – $26.99 – from the Bollinger house (the one James Bond drinks), this Cremant is given the same careful attention as the Bolly’s, great price for the quality. 3) Raventos i Blanc Cava de Nit – $29.99 – handcrafted Rosado from one of the most prestigious Cava makers from Spain, organic and beautifully nuanced. 4) NV Veuve Clicquot Yellow Label La Fridge Brut – $71.99 – great packaging, La Fridge keeps a bottle of Veuve at serving temperature for up to two hours. The great yellow label brut that’s instantly recognizable throughout the world. 5) 2000 Taittinger Comtes de Champagne – $244.99 – a class act, made from 100% Chardonnay, superb in every sense. No need to go after the $300+ ones when you can have this one. 1) 2009 Chai du Grand Vaudasniere Vouvray – $21.99 – an amazing Chenin Blanc that is slightly off-dry but would be amazing with the turkey and the fixings, fab orange blossom nose. 2) 2010 Belland-Chapuis Le Vallon Sancerre – $34.99 – very impressive Sauvignon Blanc for those who want a dry white, more minerally than overtly fruity, everything in its place. 3) 2009 Egon Muller Mosel Scharzhofberger Riesling Kabinett – $54.99 – Sweet Riesling from one of the most sought after houses in Germany. Expensive but easily worth the tariff if you want the best. 4) 2008 Ridge Monte Bello Chardonnay – $74.99 – for the Chardonnay lover who wants something top drawer. Finesse, butter, slate and apple & pineapple notes galore. Big white. 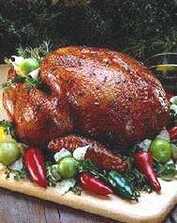 5) NV Domaine de la Vinconniere Pinot Noir Rosé – $16.99 – a great price for a fine bottle of pink that would go with turkey extremely well. Fruity, yet has some structure from the Pinot Noir grape. 1) 2010 Domaine Bulliat Morgon Cuvee du Colombier – $21.99 – Beaujolais is always a great choice for Turkey dinner, here is a new producer that has made a Beaujolais Cru with stone fruit aromas, a lovely crimson color and tasty clean fruit. And organic too. 2) 2011 Don Rodolfo Pinot Noir – $15.49 – great varietal character in this inexpensive best seller. Strawberry & cherry fruit. 3) 2010 Hamilton Russell Pinot Noir – $54.99 – from one of South Africa’s best producers, there is terroir and character to this Pinot, very French yet speaks from the South Africa language.Lovely with a gentle decant. 4) 2009 Louis Jadot Beaune Boucherottes 1er Cru – $59.99 – from the stellar 09 vintage, this is a Premiere Cru worth tasting young as it hasn’t closed down yet. Vibrant, fruity and svelt, a gentle decant would open it up marvellously. 5) 2007 Bodegas Carchelo Canalizo – $44.99 – here is something more full-bodied from Spain, with spice, earch, pepper, and cherry notes from its mix of Syrah, Monastrell and Tempranillo. 6) 2006 Leonetti Merlot – $99.99 – for those who insists on something big, here is lovely, velvety Merlot in its drinking prime. 7) 2006 Rolf Binder Hanisch Shiraz – $139.99 – finesse based Shiraz from one of the great vineyards in the Barossa. Dense yet inviting. 1) 2011 La Spinetta Bricco Quagia Moscato d’Asti – $25.99 – slightly spritzy, perfume nose and light as a feather – pair with strawberries & cream or a fruit flan – yum! 2) 2001 Chateau de Fesles Bonnezeaux – 375mL – $54.99 – world class dessert wine with orange blossoms, stone fruits, roasted nuts, honey and beeswax and stellar balance. 3) 2001 Chateau Lafaurie-Peyraguey – 375mL – $94.99 – mind-blowing right now, with an smorg of stone and tropical fruits. Full-bodied, oily, spicy and extremely long. Singing at a high pitch indeed. Serve slightly cold only. Nectar for the gods. 1) 1965 Messias Colheita – $119.99 – great nutty and creme brulee notes, pair with blue-veined cheeses. 2) 1999 Sandeman Vintage Port – $34.99 – the giveaway port of the year. Earlier drinking and it is drinking splendidly. A fraction of what other VP’s costs. Highly recommended. 3) 1991 Graham’s Vintage Port – $121.99 – 21 years young and drinking well. Pair with Stilton and roasted nuts.